Serve up this low carb Crustless Bacon and Cheese Quiche for your weeknight dinner or even brunch. Going crustless for your quiche leaves you with a quick, easy, and more affordable quiche that also cuts out a lot of empty carbs. This recipe is so satisfying you won’t even miss the crust! Trust me! I’ve been making lots of egg recipes lately because of my low carb diet. I whipped this up for dinner, and it was incredible! Best of all the leftovers the next day was just as good. My family enjoyed it as much as I did, and the prep was painless. By getting rid of the crust, you save time, and to be honest, I don’t love the crust in quiche, to begin with. 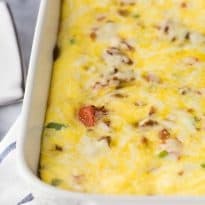 Mushrooms, tomatoes, bacon, sour cream for a creamy base, and of course we can’t forget the eggs. Loaded with protein and flavor, is what you get in this quiche recipe. Plus, because it is wrapped in eggs, it is a great way to sneak some veggies into your kid’s diet. Is a Frittata The Same as a Crustless Quiche? Frittata and a crustless quiche are similar, but the way a frittata is cooked is what makes them different. Both are egg based with added ingredients, but the cooking process is different. Frittatas start on the stove top and then get transferred to the oven to finish baking. A crustless quiche gets assembled and pops right in the oven to cook up. Yes, you can freeze your crustless quiche once you have cooked it and allowed it to cool. Just slice your quiche into single servings and place in an airtight container or wrap each slice in plastic wrap or aluminum foil. Place in the freezer for up to 3 months. 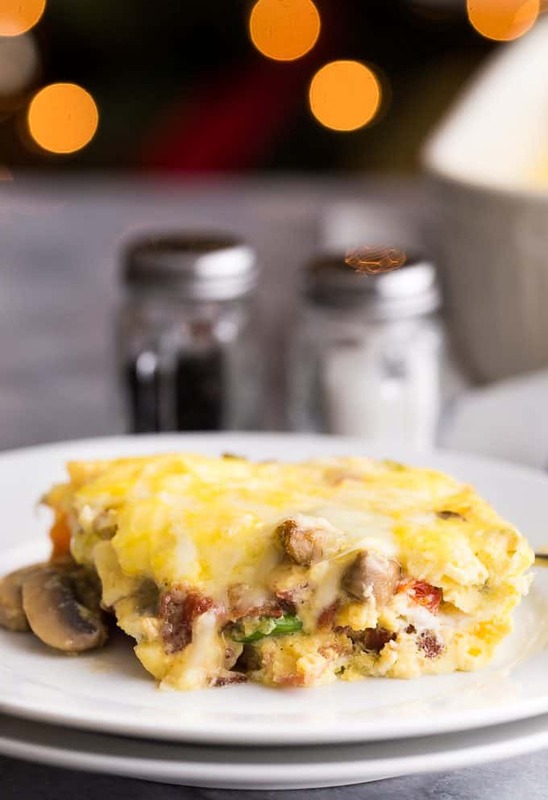 To reheat your frozen quiche, allow to thaw in the fridge overnight, or place in microwave and heat at 30-second intervals until it is warmed all the way through. No, quiche does not have to have a crust; this recipe is proof. Your quiche is essentially a custard base, and if you pour into your pan, it will bake up nicely without the crust. This recipe is excellent and slices up beautifully for serving up guests. Pair with some fresh fruit, side of bacon or sausage, and call it breakfast of champions. Yes! If you want to prep this the night before, go ahead. Then when morning rolls around, turn the oven on and bake. Just allow 10-15 minutes extra since you are starting with a chilled filling and pan. Feel free to add in or take away some of the vegetables used in the recipe. You can easily adjust the flavors to fit your liking. Here are some great ingredients that will work well in this recipe. Mix and match and try to find ingredients that you enjoy. I love to raid our produce drawer and see what I have on hand to toss in. This is a beautiful way to use up produce that might expire if you don’t get it cooked up. Hosting brunch or have some guests over? Here are some great recipes to pair next to your crustless quiche to give your guests an option. I mean as crazy as it sounds, not everyone is a fan of eggs (I know right?!). So having a few other items next to your quiche is a great way to play it safe. Or if you are like me, you eat the quiche alone and call it a breakfast or even dinner option. Give this simple crustless quiche a try. I love the cheese and bacon paired with fresh vegetables inside. A nice low carb option that is packed full of protein and nutrients to fuel you to finish out the day till next meal time. Perfect for a low carb diet. Cook bacon in a skillet until crisp. Remove bacon from skillet, reserving 1 Tbsp. drippings in skillet. Add mushrooms to reserved drippings and cook for another 5 minutes. Remove from heat. Crumble bacon. Add to skillet with remaining onions and tomatoes; mix well. Whisk eggs and sour cream until well blended. 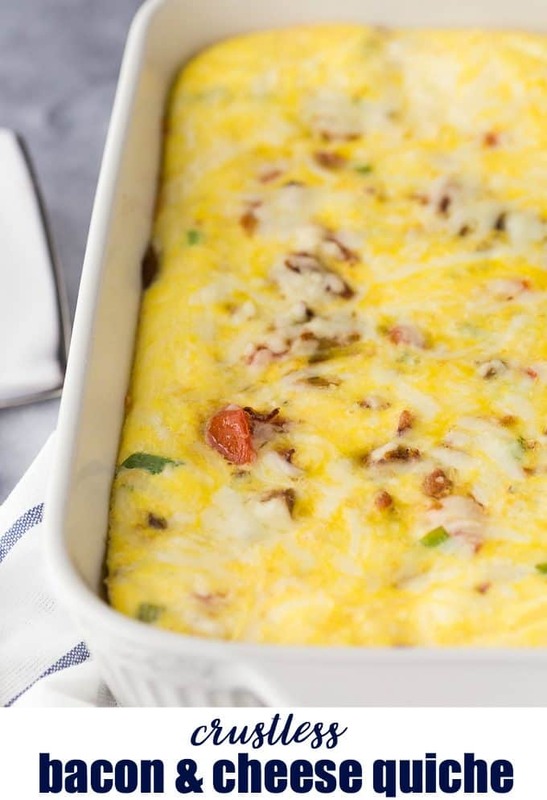 Pour into greased 13×9-inch baking dish and then top with bacon mixture and cheeses. Bake for 30 minutes. Let stand about 5 minutes to cool before serving. oh yummy! I don’t think I’ve ever added sour cream to my quiche. I made my first crustless quiche a couple months ago and really enjoyed it! Perfection. All the bacon and egg and cheese that makes my life whole, without all of those gosh darn carbs. NEED to make this soon! I am on a low carb life style and I get tired of the same old thing. This recipe looks great. Pinned. Yum! What a perfect dish to serve brunch guests – Thanks for the recipe! love this! I make quiche sans crust whenever I can. Looks great and love the addition of sour cream. Thanks for sharing with us at Funtastic Friday! What a great Idea. I am on a low carb diet and I am using a lot of eggs and never thought to make just a bake. Let me know if you have any other carb free egg dishes. Thanks again for this recipe. 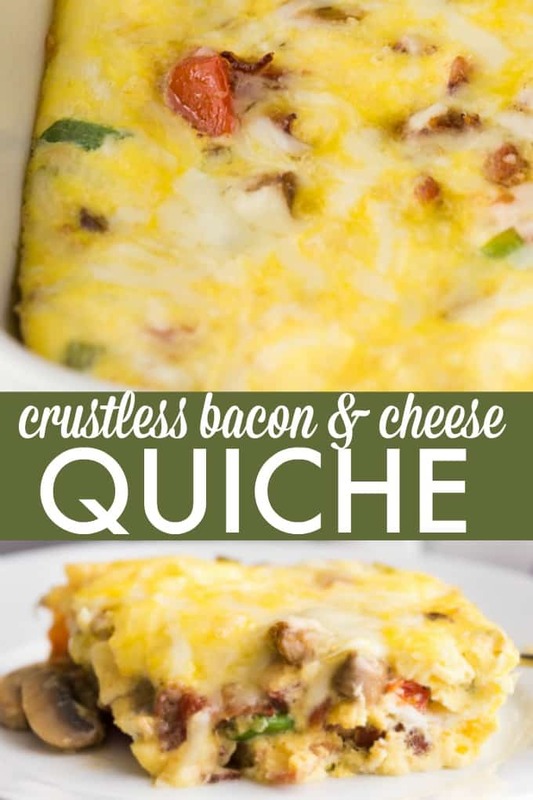 I just pinned your Crustless Bacon and Cheese Quiche, this is great! Thanks so much for sharing your awesome recipes with us at Full Plate Thursday. Hope you are having a great week and come back to see us real soon!